Centrally located one block off NE Broadway, one of Portland's most popular thoroughfares, we are one block from Safeway, the Lloyd Center (Portland's oldest and biggest shopping mall), the Convention Center, The Rose Quarter, some of Portland's most popular restaurants and movie theaters. There is also a MAX light rail and Portland Streetcar stations near by. Pearl District for additional shopping and entertainment, Portland State University and the Oregon Health and Sciences University (OHSU) campus. I will stay! I recommended it a hundred times over. 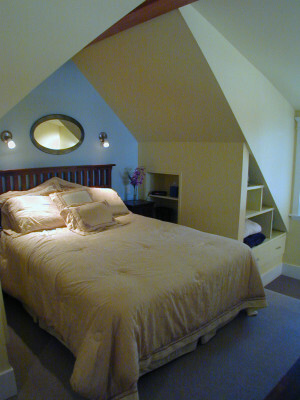 The loft apartment features a bedroom area on the upper level of the unit overlooking the living room. 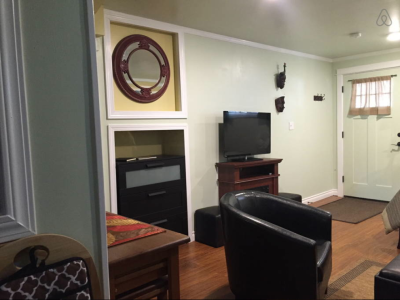 First level features full kitchen, living room w/ full-sized futon sofa/bed, chair/twin bed and bath. 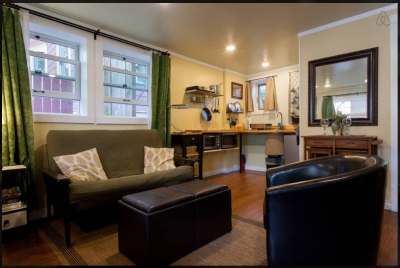 Very comfortable futon sofa/bed, kitchen, sitting area and large bathroom. Great storage; total privacy—cozy environment! Rose Parade time and the city was alive and bustling! Public transit was about a 10min walk or less. We did have a car as we drove from Seattle, but we're able to get around just fine by using the rail systems and road cars. The place is cozy and definitely felt like a home away from home. Can't wait to come back to Portland!